EnKon A-series modular standard lifts offer features and functionality that can be easily adapted to address changing size or ergonomic requirements. Modular components partner with Herkules-patented Air Bag™ technology and scissor lift power to improve ergonomics and productivity by quickly and easily raising loads to the desired working height. A-series lifts offer a number of easily added bolt-on options: control packages, platforms, safety skirting, and portability packages to name a few. EnKon A-Series Modular Lifts are the result of decades of analyzing, assessing and addressing industrial application needs. 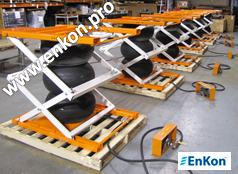 The EnKon team designs, engineers and manufactures A-Series Lift Tables that meet, exceed and even re-define the standards for safe, powerful lifting solutions. 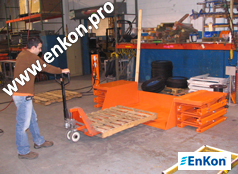 While custom material handling lifts require a sometimes lengthy lead time, many EnKon A-Series scissor lifts are pre-built for quick delivery, enabling customers to address needs quickly, efficiently, and effectively. Some lifts can quick ship in as little as 3-5 days, providing custom solutions at off-the-shelf pricing and timing. EnKon’s A-Series line of air lifts offers choices between different Lift, Tilt, or Lift and Tilt models, depending on the application. After choosing the base model that best fits your needs, you have the ability to add a variety of options. The easily adaptable A-series component structure enables customers to re-purpose and re-use lifts, rather than purchase an entirely new lift in the future, saving significant time and money. A lift and rotate air scissor lift can become a lift and tilt material handling lift table; simply unbolt the rotate module and bolt on the tilt module. With a small footprint (20" x 41") the ALS04 material handling lift is ideal for use as a cart lift, providing accurate positioning of material for easy access at the desired working height, helping to improve ergonomics. EnKon’s ALS04 air scissor lift table has a travel of 13" and a raised height of 20". 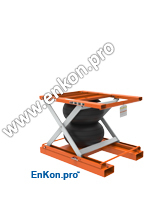 The most popular A-Series material handling lift, EnKon’s ALS01 improves both ergonomics and productivity in an economical fashion. Providing a raised height of 31", a footprint of 36" x 47", and a capacity of 3000 lbs., the ALS01 air scissor lift table addresses most pallet and bin positioning needs. The heavy duty version of our popular ALS01, the ALS02 air scissor lift table doubles the lifting capacity to a maximum of 6000 lbs. 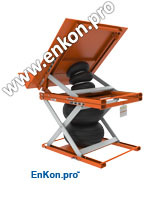 This material handling lift has a raised height of 31" and a footprint of 36" x 47". The ALS02 improves ergonomics and productivity inexpensively. A stainless steel version of our ALS02, the ALS05 air scissor lift table offers all the same features, with the added benefit of corrosion resistance. The ALS05 material handling scissor lift table provides a raised height of 31”, base dimensions of 36” x 47”, and a lifting capacity of 6000 lbs. Providing higher travel for applications that require a more flexible working height, the ALS03 improves both ergonomics and productivity. 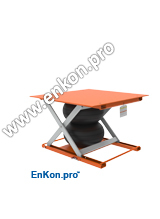 This air scissor lift table has a raised height of 42", base dimensions of 36" x 47", and a capacity of 3000 lbs. Providing a tilt angle of 30 degrees, the ATS08 is an air scissor tilt table designed to place material at the optimum working angle. Ideal for improving ergonomics in material handling applications, the ATS08 offers a small footprint of 20” x 41”. Our material handling air scissor tilt tables can be used as stand-alone units, or paired with an ALS air scissor lift with the same base dimensions. EnKon also offers ALTS air scissor lift and tilt tables which provide an A-Series tilt factory mounted to one of our A-Series lifts. With a tilt angle of 45˚, the ATS09 material handling tilt table easily places materials at the optimum angle, improving ergonomics in material handling applications. This air scissor tilt table has a small footprint of 20" x 41", and can be used as a stand-alone unit, or paired with an ALS air scissor lift with the same base dimensions. 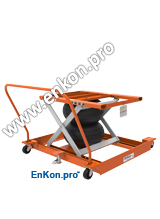 EnKon also offers ALTS air scissor lift and tilts within the A-Series product line, which provides ATS tilts factory mounted to our ALS Lifts. An air scissor tilt table that places materials at the optimum angle, the ATS06 has a footprint of 36" x 47", and a tilt angle of 30˚. The ATS06 air scissor tilt table can be used as a stand-alone unit, or paired with an ALS air scissor lift table with the same base dimensions for increased vertical travel. 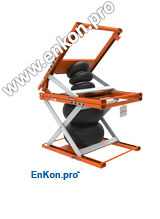 EnKon also offers ALTS air scissor lift and tilts within the A-Series product line, which provides an air scissor tilt table factory mounted to an air scissor lift. Offering a 36” x 47” footprint, the ATS07 material handling tilt table easily places materials at the desired angle for improved ergonomics. The ATS07 air scissor tilt table provides a tilt angle of 45˚, and can be used as a stand-alone unit, or paired with an ALS air scissor lift with the same base dimensions. 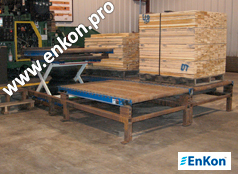 EnKon also offers ALTS air scissor lift and tilt tables that pair our Lifts and Tilts directly from the factory. Pairing the ALS04 lift with the ATS08 tilt, the ALTS12 material handling scissor lift and tilt table has the smallest footprint in our A-Series product line with dimensions of 20" x 41". The ALTS12 material handling lift and tilt table has a vertical travel height of 13", and a tilt angle of 30˚. This Lift and Tilt helps to support material handling operations by placing material at the optimum working height and angle, improving ergonomics and productivity. Providing a vertical travel height of 13” and a tilt angle of 45˚, the ALTS13 pairs the EnKon ALS04 lift with the ATS09 tilt. The ALTS13 scissor lift and tilt table has the smallest footprint in our A-Series product line with dimensions of 20" x 41". 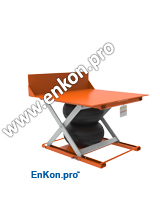 EnKon’s air scissor lift and tilt tables help to improve ergonomics in material handling applications. Pairing the popular ALS01 lift and ATS06 tilt, the ALTS10 air scissor lift and tilt table provides a vertical travel of 24", and a tilt angle of 30˚. The ALTS10 material handling lift and tilt has a footprint of 36" x 47", and offers the opportunity to place material at both the optimum working height and angle, improving ergonomics in material handling applications. Providing a tilt angle of 45˚, the ALTS11 air scissor lift and tilt table pairs the popular ALS01 air scissor lift with the ATS07 air scissor tilt. The ALTS11 has a vertical travel of 24", and a footprint of 36" x 47", making it ideal for use in material handling bin applications for improved ergonomics. With a tilt angle of 30˚ and a vertical travel of 33”, the ALTS14 air scissor lift and tilt pairs our ALS03 lift with the ATS06 tilt. The ALTS14 material handling lift and tilt table has a footprint of 36" x 47", a high travel capability and solid lifting support; providing a solution for applications requiring a tilt, along with higher vertical travel requirements. Offering a 36” x 47” footprint, the ALTS15 material handling scissor lift and tilt table pairs EnKon’s ALS03 Lift with the ATS07 Tilt. The ALTS15 has a high vertical travel of 33", and a tilt angle of 45˚, providing powerful and reliable lifting support for improved ergonomics in material handling operations. Allowing easy access to all 4 sides of any material load, Rotate Packages improve ergonomics in loading and unloading operations as well as many other applications. Rotate Packages are available as an addition to our ALS air scissor lift tables, or as standalone units mounted to the floor. EnKon also offers the option for spring detents, providing fixed stop points at every 90˚ or 180˚, depending on the rotate platform that is chosen. EnKon enables users to choose the controller that best fits the application in which the lift is being used; either a hand controller or a foot controller. For our ALTS air scissor lift and tilt tables, dual foot pedals and dual hand controls mounted on the pedestal are offered. In addition, we offer several safety packages including a filter, regulator, and a lockout tag out device. Offering a variety of thicknesses, sizes, and corner gussets, EnKon provides a number of options for platforms on our ALS air scissor lift tables, including custom Lift Platform opportunities. Increase your ATS air scissor tilt table or ALTS air scissor lift and tilt table’s flexibility by adding a Tilt Platform. Options include plate thicknesses of 1/2" or 3/8" and various size dimensions, all of which have a large gusset helping to ensure safe handling of materials. 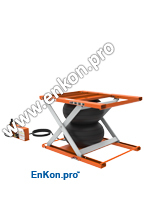 EnKon also offers the opportunity for custom Tilt Platforms. Easily mounted to select rotate packages, our standard Rotate Platforms are 1/2" thick, with 36" x 48" or 48" x 48" platform sizes available. 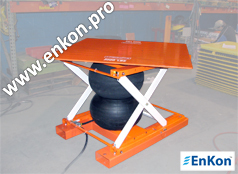 EnKon also offers Rotate Platforms with either 90˚ or 180˚ detents for fixed stop points when paired with a rotate package with spring detents. 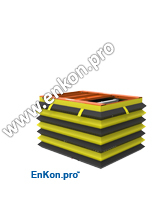 For added safety, platforms with corner gussets are available. Custom platform opportunities are also an option. Keep your A-Series lift, tilt, or lift and tilt’s operation debris-free and protect users from pinch points with Safety Skirting. EnKon offers Safety Skirting for every ALS, ATS, or ALTS model in our A-Series product line. 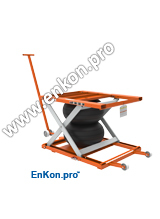 With a Safety Skirt, EnKon’s lifts conform to ANSI and OSHA standards. All of our A-Series scissor lifts, tilts, and lift and tilts can be equipped with wheel attachments and a dolly for easily moving the lift from one location to another; eliminating the need for a fork lift truck. 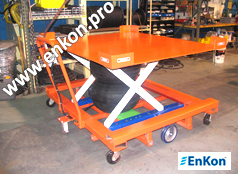 For applications requiring mobility, EnKon offers a caster cart for A-Series models with lift capacities of up to 3000 lbs. Our caster carts feature four heavy duty casters and two foot brakes for safe and easy mobility in material handling operations. Add Fork Pockets to any A-Series lift, tilt, or lift and tilt for effortless movement of the lift, ideal for applications where a fork lift truck is present.